Dive Journal: Details of this dive day, March 11, 2010, were captured by Linda at torksinthailand.blogspot.com/2010/03/dive-dive-dive.html. This afternoon between dives, the three of us jumped onto the inflatable ("tuk-tuk") and zoomed off to the famous Honeymoon Bay beach on the backside of island #4. Gorgeous sugary sand, impossibly turquoise waters, postcard scenery. Janel read a book for a while while Linda and I explored around the beach. Too soon, it was time to return to the boat. Tonight's dive is very close to this beach, and is planned as an easy going reef dive. 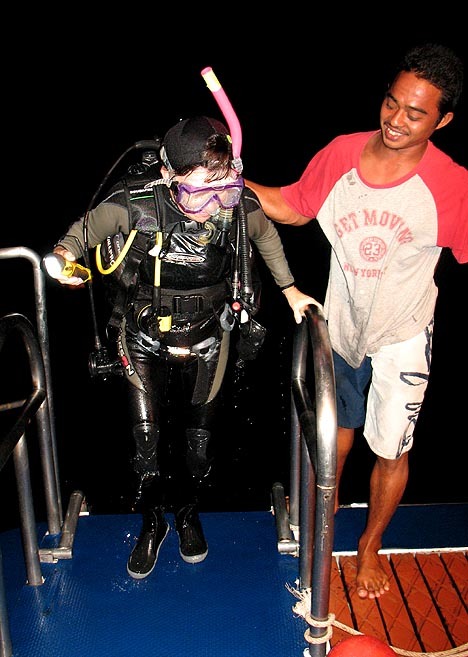 Queen Scuba limits night dives to 45 minutes and tries to stay shallow with them. The three of us are excited - we always love night dives! On descent, there is a HUGE blue spotted pufferfish with psychedelic concentric eye rings getting settled in for the night. We also immediately spot a couple of giant moray eels and a few lionfish. Kim finds a cool-looking black sea cucumber with red spots. Linda loves the sight of several feathered starfish, basket-like creatures that perch on top of coral mounds, clinging on with an inverted cone of hook-shaped tentacles. Wild looking. We also check out a big fuzzy looking spider crab. I'm entertained at one point by a fast twirling worm who swims skyward at my approach. Shining my torch vertically up through his swimming pattern is sort of an eerie sight. We don't really need a safety stop here because we end the dive with 5 minutes of scouring around the bottom at only about 20 feet. As we finish up and rise through the dark water, we check out the bioluminescence. It is great here. Not so much in abundance, but in brightness. Very nice. The concensus is that we've all been on better night dives, but we come up grinning just the same. The dinghy comes by to pick us up and we're soon back on the boat, taking a warm shower, ready for dinner, and already thinking about sleep.